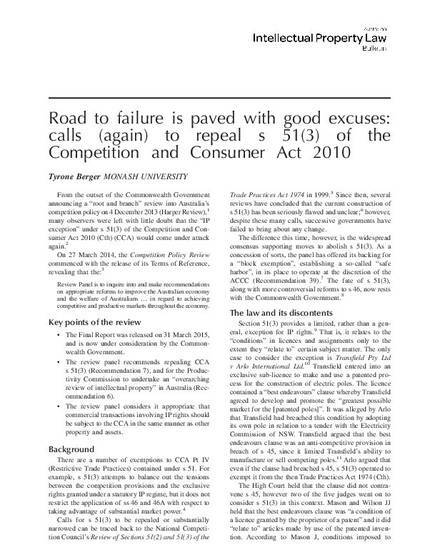 From the outset of the Commonwealth Government announcing a ‘root and branch’ review into Australia’s competition policy on 4 December 2013 (‘Harper Review’), many observers were left with little doubt that the ‘IP exception’ under s 51(3) of the Competition and Consumer Act 2010 (Cth) (CCA) would come under attack again. The concern (now and past) for the Government is acheving a balance between the granting of IP rights, which seek to increase incentives for R&D investment, and curbing any anti-competitive effects arising from increased market power. Encouraging firms to innovate is normally seen as an underlying justification of IP rights; but this is also a key goal of competition policy. Whether IP rights raise competition concerns must be viewed in terms of the nature of the rights, and the IP holder’s conduct in respect of those rights. A cursory examination of the operation of s 51(3) reveals its failure to take into account the intricacies of IP laws.